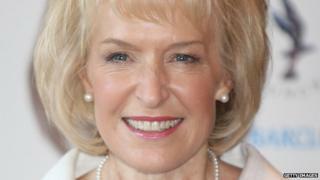 Two companies headed by health guru Rosemary Conley have gone into administration. Leicestershire-based Rosemary Conley Food and Fitness Ltd and its sister business Quorn House Publishing Ltd were put into administration on Monday. Six staff have been made redundant, but Rosemary Conley Classes are not affected, because they are run as independent franchises. Mrs Conley, 67, said it had been a "difficult decision" to make. The entrepreneur, who was born in Leicester, said in a statement: "It is business as usual for all the classes around the country. But for the core business the board and I have had to make this difficult decision. "It's a day which the team and I have worked incredibly hard to try to avoid but the board and I believe that this is the most responsible course of action to take. "My heart goes out to the staff affected, and we are talking to them today to try to work out how best we can help them." She added that she had invested a lot of her own money into the business and had not drawn a salary for several months. At the company's Leicestershire headquarters, 26 staff have been retained but six will lose their jobs. Mark Hopkins of Elwell, Watchorn and Saxton has been appointed joint administrator. He said: "The board has taken a responsible decision, going into early administration creates a restructuring opportunity. "Sadly the process involves some difficult decisions including the need to make a number of employees redundant." Rosemary Conley Food and Fitness Ltd is the businesswoman's lifestyle company, and sells slimming and health products, as well as fitness regimes. Quorn House Publishing Ltd makes the Rosemary Conley magazine. Mrs Conley, who has written a number of health books and presented many fitness films, was made a CBE in 2004 and given the Freedom of the City of Leicester in 2009.